Oct. 13, 2017, 5:30 p.m. The Ghana Internet Exchange Point (GIX) in collaboration with the Ghana Internet Services Providers Association (GISPA) and with sponsorship from KNET invited two facilitators from AfriNIC to hold a four day workshop on IPv6 and INRM with technicians from network services providers in Ghana. Speaking at the opening of the workshop, the Manager of the Ghana Internet Exchange Point, GIX welcomed participants to the workshop and reiterated the importance of building the capacity of all technical leads of the various Telecos and Internet Service providers in order to seamlessly deploy IPv6 now across the country. 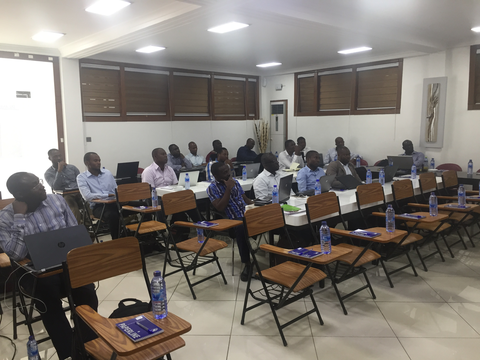 He asked all participants to take the training seriously as their expertise is needed now to take connectivity in Ghanato the next level. The facilitators, Mr. Brice Abba and Mr. Olatunde Awobuluyi introduced participants to AfriNIC and took them through Internet Number Resources, databases and INRM labs on the first day of training. From the second day, the facilitators took participants through IPv6 theory and practicals with a lot of simulations. Participants expressed satisfaction with the training facilitators and course relevance and expressed the desire for more such training workshops in the near future.